This entry was posted in Environmentalism, Growth and Growing Pains, Plant Totems, Social Justice, Totems, Unverified Personal Gnosis. Bookmark the permalink. Awesome. 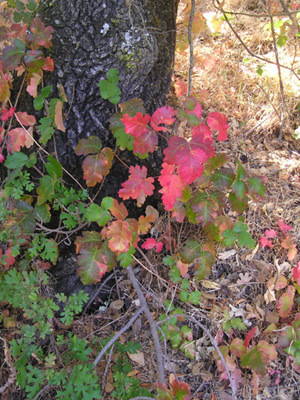 One more thing to add about what poison oak & ivy have to teach us, is the value of awareness – and the cost of ignorance & inattention. As modern humans we are used to living in an environment that practically demands that we shut down our awareness (in order to cope with the insane sensory onslaught), and encourages complacency and falling into “the rut” of mindless routine. Unfortunately, combined with the near total ignorance many of us have for the wider community of life that also occupies landbase we live on (because we aren’t taught by our elders, and spend so little time getting to know the land), this means that many of us don’t recognize these plants when we venture out into the forest, and even if we did, we probably wouldn’t notice them until it’s too late. It’s interesting how easy it is to fall into the mindset of (“dang ivy/blackberry/nettle/whatever), when they inconvenience us as we move along – forgetting that we are the ones who move around, not them. Their defenses are completely passive, like you said, whereas we are the ones who made the choice to walk into them. If that movement harms us, we shouldn’t blame the plant, but our own unawareness. It is truly the height of hubris to assume that every other creature (including plants, who don’t move!) should just get out of our way – and yet, that is our default mindset (I have noticed it in myself at times, and expressed often by others). I think that says a lot about the worldview of modern humanity. That’s a really good observation. This is kind of what I was attempting to get at in my previous post about wildness–when a lot of us go out into the wilderness we miss things we wouldn’t if we weren’t shut down so much. And plants were here way before we were. At the risk of sounding a little like Pamela Isley, I feel we owe them more notice simply because they shaped the landscape long before we did, and many of them are a lot more resilient than we are. This was simply an amazing read. I’ve alway felt bad for the fact that poison ivy and oak are so vilified when they really aren’t that harmful, all things considered (excepting to those who are deadly allergic to them). The nearly maniacal lengths people go to to try to rid an area of them seems almost like a temper tantrum from a species who hates not having things “their way”. I think it is fine to try to keep them from areas of heavy traffic (that is, after all, us asserting our boundaries) but the sheer hatred people project onto these plants seems uncalled for. Thank you 🙂 And these do also expose our control-freak habits, as well as being a good lesson in patience and flexibility. After all, they’re the ones who are rooted down and have less obvious direct control over their environments. I did feel a bit of itch, though I think some of it was memory from my bout of poison oak back in February! This was a great read, though as an ecologist I’m obviously biased towards your way of thinking here :P. I actually don’t mind poison oak or ivy but then again I’ve never had any major skin issues when touching them. Glad you enjoyed it! And I seriously envy you your non-reactivity to urushiol; I practically look at the stuff and break out. This reminds me that I’ve been meaning to meditate with Bindweed/Wild Morning Glory (and keep forgetting). I tend to leave lots of room for weeds on the land I live on–most of them I feel a lot of affection for. But I get cranky about the Bindweed, and I’d like to have a talk with her. I bet she would have a thing or two to tell me . . . thanks for this amazing post, and for the reminder. I should sit and talk to Himalayan Blackberry and English Ivy as well. Theyire two of the biggest invasives in this area. This is really good to hear! I am glad to hear you have a totem to help you deal with cyber bullies trying to stop you from having your personal practice. Poison Oak also came up recently in a forum I am on, and as I have no reaction to it, I think its a good plant for me to work with in a *different* way. I’d be curious as to how someone who doesn’t react to it would relate; I wonder how the lessons might be different? Glad to see you further get to know poison oak. And thanks for the shout-out! In my own observations, it’s actually the opposite of what Jessica said in that I am hyper-aware of poison ivy when I’m outside in the summer. Not only do I react strongly to the urushiol on my skin, but I have a phobia of it too. I am actually afraid of poison ivy; not so much in getting it, hell I itch all the time, but rather of where the invisible foe is that I cannot see. It’s that invisible lurking ‘monster’ that bothers me about this plant. If I could see the oil to avoid transferring it to anything I’d be happy and then I could easily give the plant its space. The other thing to keep in mind Paleo, is that some species are invasive, poison ivy being one of them. And when you think about it, what good is it really? It’s not food for animals, not particularly pretty, so where is the use for such a plant? (Of course, I could be heavily biased against it too!) If anyone knows a practical use for poison ivy, I’d love to learn it! I’m not saying that we should exterminate it simply because it doesn’t serve a common purpose, but rather, the wide range of the plant in the US is out of control, hence why so many people try to either tame it or eliminate it altogether. Similarly to a dangerous animal, I have no trouble in wanting to avoid the stuff. The hard part for me is identifying it and getting over the fact that it’s not really “out to get me” when I’m out hiking. The invisibility is a definite factor; I am not even sure where I contracted it the last time, and while I can keep an eye out for the leaves, in thick brush it can be hard to see. I really enjoyed reading this. I work with “pest” and “invasive” plants all the time, and it’s nice to know someone else who gets it. Jewelweed is awesome. I like how the seedpods “explode” out with slight pressure. Hummingbirds love jewelweed flowers. Huh–I wonder how their relationship works out totemically, and how that occurred over time? This is true. My husband once weed-whacked a patch of poison ivy, got it all over him. Luckily there was also jewelweed in amongst the poison ivy, which he also got all over him, and he managed to get out of that one itch-free. Wonderful post! And what an interesting idea… a shadow totem… I’ll have to read and think more about that! I am coming from a place of having studied the plants for years from the point of view of a botanist, allergist, chemist, herbalist and more— although I am none of the above. I liked Jessicas concept of the plants enabling to develop more of an awareness when we are in their territory, because actually we are reacting to them, not they not to us. They are not setting any boundaries. The allergenic oil (urushiol) is in the resin of the plant. Like pine resin, it seals wounds in the bark and leaves. The oil is not toxic, bad tasting, or poisonous. Our immune systems just sometimes decide that it is an enemy, and all the itching is caused by our own bodies, not like the sting of nettles for example, which the plant causes by chemicals in its hairs. What good is it? It is such a ground stabilizer that it was planted on the dikes in Holland. Deer eat it, birds eat the seeds, small animals shelter under it, bees love the nectar. After a fire, it quickly covers the bare earth preventing erosion. Thank you! This rounds out my understanding of those plants even more! Lisa, native american tribes that lived in poison ivy/oak country were exposed to the plants constantly. Many probably developed allergies at an early age, driven with what’s called the “effector system.” This would go on indefinitely, but the “regulatory system” finally shuts the fire down.” But, with constant exposure, after time, its possible for the “regulatory system” to become stronger and you can develop a tolerance, or at least not react as strongly over time, providing your exposure continues. The immune system is extremely complicated, and not completely understood yet. A study many many-years ago on infants who had never been exposed to poison ivy (in an institution for developmentally disabled) showed that if they were fed poison ivy extract directly into their stomachs, they would develop a life-long tolerance. In Japan, China, Korea, the Japanese lacquer tree has the same allergenic oil (urushiol) with subtle chemicals differences that make it a good medium to create the famous lacquerware. The lacquer painters can come to the occupation with sensitivity, but most over time lose it, and when they leave temporarily for a vacation for example, they might eat some of the urushiol paint while gone. Nobody should eat a leaf of poison oak/ivy on a whim though, because you could get a raging head to toe case. ps, most articles on the internet on poison oak/ivy/sumac have many wrong statements, because the author copied from other wrong articles instead of finding clinical studies. Wonderful reply Sandra, thanks so much! I didn’t realize the Japanese lacquer tree had the same chemical constituent, very interesting! I wouldn’t build up immunity in that way either, I would start with Rhus Tox (Homeopathy), since the doses are quite diluted. One of my friends who has lots of this in her yard would take a dose before working in her garden and when she did, she never got a rash! I really ought to head out that way; there are huge sections of the coastline I simply haven’t had a chance to see yet! Thank you for the invite! Consider Neahkahnie Mountain and then call me/us. :oD We are here in her shadow. Look up the phone number codes for the area in Manzanita, Oregon and then you can find me at that area code at 6096. Hugs….